Have you been designated as the team umpire? Or maybe you have signed up to help as a volunteer and are not yet sure what you want to do? Perhaps you are just curious what is means to be on the "third team." Whatever the reason, whatever your gender, young or young at heart... please join us for our Spring Umpire Training Clinic. 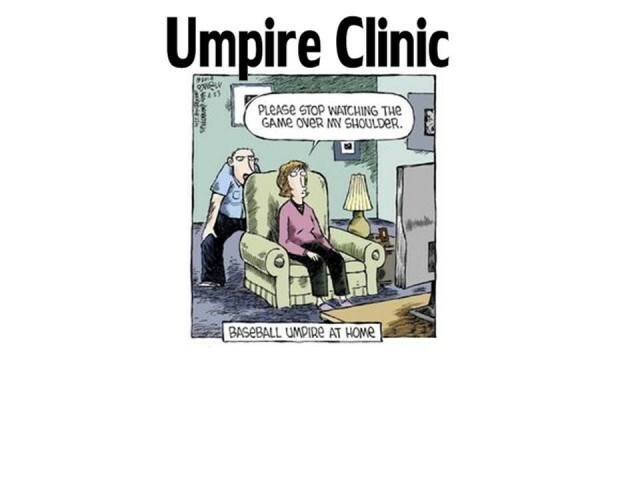 Many people feel nervous about trying their hand as an umpire. Not sure about the rules... not sure how to make a call... visions of managers yelling and kicking dirt on the umpire's shoes. Allow yourself the opportunity to put all that aside for a moment. Take a couple hours and let us show you a few tricks, give you a few tips, and give you the confidence to go out in the field and make a difference.